If Chucky was worried he would lose his place amongst the creepiest dolls in cinema history to Annabelle, he needn’t worry any longer. The much anticipated followup/prequel to the fact-based horror hit The Conjuring, directed by James Wan, featuring the possessed doll who’s cameo sparked interest in the original film, does not live up to expectations. It certainly has its moments of unheimlich (uncanny) as laid out by Sigmund Freud in his study on horror, causing some anxiety and terror; but, the narrative just doesn’t hold up very well and was not handled as well as it could have been. However, it is a good movie to watch with friends during the month of October, or if you are looking for a decent scare during which you can hold on to your date’s arms or vice versa. 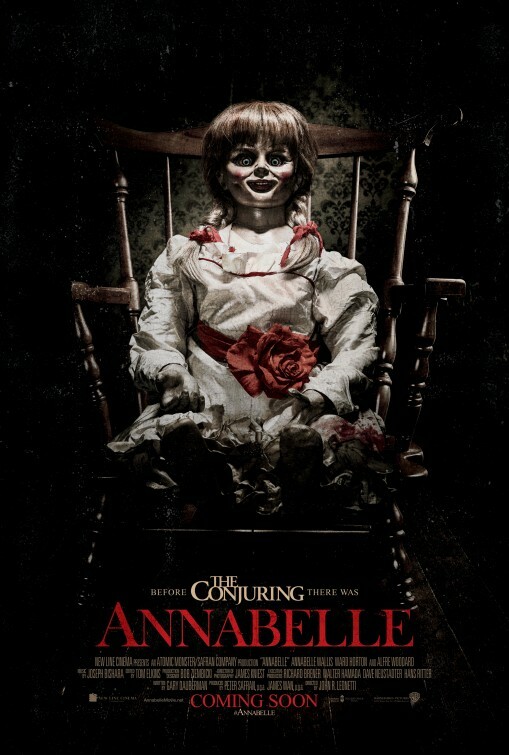 Annabelle is about the story of the possessed doll that famed and ordained supernatural and paranormal experts Ed and Loraine Warren (most famously known for their investigation into the Ammityville case), still to this day, have locked away in a glass cabinet that is blessed by a priest twice a month. Prior to coming into possession of the doll, Annabelle once belonged to a young couple as part of an extensive doll collection. Following a brutal murder next door and an attack upon themselves by the neighbors estranged and mentally disturbed daughter, John and pregnant Mia discover that their attackers were part of a Satanic cult involving blood sacrifice. Unfortunately, the attackers conjured up more than a plan of attack. A malevolent and unprecedented evil entity now occupies the doll, in the pure white dress, as a conduit from the spiritual world into ours. John and Mia must uncover why the doll is hell-bent on their utter destruction and drive the evil spirit from it before it harms their family. The failed haphazard screenplay, written by Gary Dauberman, took the low-rent approach to horror and just had cheap scare after cheap scare throughout the story. In stark contrast to The Conjuring, there is little to no fact-based content in the story at all, save the archival footage from the Warren’s interview with the young ladies who were last in possession of the Satanic doll. Unlike Chucky, Annabelle is never seen directly orchestrating any of the horrific incidents during the movie–not even so much as moving her eyes or head. With the exception of the doll occasionally being found out of place, the doll is fairly stationary. Both the direction and writing are week and is little more than a Chiller or SyFy channel original movie. The film is very generic in story and structure, and will likely be a faint memory by the time you get back home. It is obvious that the film would have faired by much better had Wan taken the reigns instead of turning it over to another less capable director, who directed films like Mortal Kombat: Annihilation. Equally unmemorable are the two leads. Their respective performances were so bland that it will have you looking for the salt to add flavor, or look for the cue cards they are obviously reading. The film will most like rake in the cash and create a nice profit for Warner Bros and New Line due to the low budget (with respect to comparable theatrical films). If you can only see one movie this weekend, definitely select Gone Girl over Annabelle.